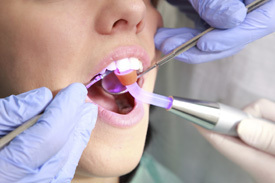 Gum disease is a serious condition that is irreversible. With the proper management, however, even those who already have gum disease can maintain their smile. Non-surgical periodontal therapy is one of the best ways to combat gum disease before it leads to tooth loss. At Dental Link, our Wembley Downs, Sorrento and Doubleview dentists work closely with you to keep your teeth healthy as long as possible. An effective treatment focuses on keeping the bone and gum tissues around your teeth healthy, too. Unfortunately, they can be damaged when small amounts of plaque congregate beneath the gums. It later calcifies and causes receding gum tissue, along with bone loss. Eventually, your teeth can become mobile or even fall out. A patient is never “cured” of periodontal disease, but it can be stabilised by the treatment interval recommended to you by our Doubleview dentists and dental hygienist and therapists. During a three-month period, the bacterial pathogens that cause active periodontal disease begin to repopulate or colonise, hence can reactivate the disease. Frequent removal of the bacteria from under the gum line can control the inflammation and can often prevent the further breakdown of the bone and gum supporting your teeth. Though gum disease cannot be completely reversed, periodontal maintenance is one of the tools we can use to effectively halt its destructive progress. Sometimes a preventative cleaning isn’t enough. If you have symptoms of bone loss, our dentists, hygienists and dental therapists provide gentle, deep cleanings to remove calcified build-up. These therapies encourage a healthy environment that inhibits the spread of disease. The team at Dental Link will help you remove harmful bacteria from your teeth and show you how to maintain optimal oral hygiene to prevent it from returning. We’ll advise you on what you can do at home and how often you should come back for regular cleanings. New patients are always welcome to book a time with our dentists. All insurance plans can be filed on the spot with our HICAPS machine, and we offer convenient Saturday visits that fit conveniently even into the busiest of schedules. Contact us today to arrange your appointment!